That F'ing Monkey: Hangover Thursday: Like Coffee? It’s Hangover Thursday, how’s your head? I was up all night partying, so I am tore up today. No, that’s not true at all. My boy woke up at like 3 this morning and wanted to party. That’s why I’m really tore up. 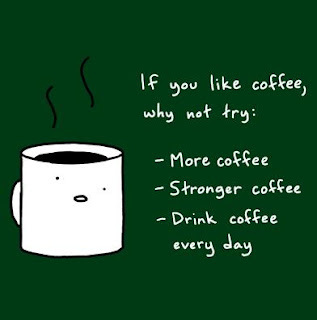 So today on Hangover Thursday we’re going to talk about coffee. I can’t say I’ve ever been hungover and not drank coffee, so I think we’re still fitting in the theme. Married to the Sea is a pretty fantastic web comic that does things a little differently than most do. I enjoy letting a few weeks build up and then going through it that way. It was because of Married to the Sea that I went to the store they share with toothpaste for dinner and Nataliedee. It was on this wonderful Sharing Machine website that I found the shirt you see pictured above. 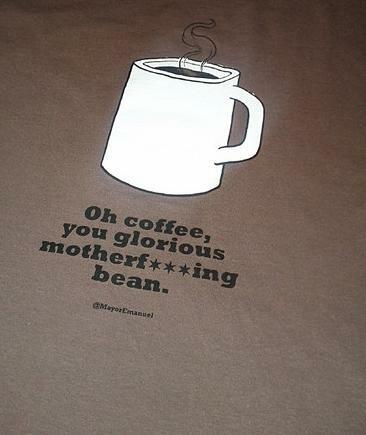 I have the reputation at work as the guy who can’t do anything without his coffee; I really think I need to own this shirt. So being in Orlando, I’m not really up to date on Chicago politics. I know it’s a shortcoming of mine, I hope no one holds it against me. Anyway, when rumors that Rahm Emanuel was going to enter the mayor’s race someone created a fake Twitter account that claimed to be Emanuel. It is because of that fake Twitter account that the shirt pictured above exists. I think it sums everything up pretty nicely.